When our friend Adam was still a part of the team we once discussed with him whether the state of Indiana is turning into the US capital of doom metal. Whether there is anything in our Midwestern water or air, but the truth is undeniable, there is a good preponderance of doom metal purveyors hailing from this neck of the woods. Gates of Slumber, Apostle of Solitude and now Stone Magnum, there is one common trait that can one see from these Indy bands. While putting out quality releases, all of them also sound authentic and not overproduced, like they have just stepped up on the smoked up small bar stage to play a live performance. Led by guitarist Dean Tavernier (Skullview) Stone Magnum eponymous last year debut has it in their gut to deliver an album referencing many classics in the genre, yet blending it through their own do-it-yourself prism. Not familiar with Skullview or any of the other members’ previous bands, it seems that Stone Magnum collective listening pleasures definitely included Black Sabbath, Candlemass, Reverend Bizarre, but also traditional heavy metal. The songs on the album combine friendly familiar riff chug (Fallen Priest) and stretchy guitar fabric, full of interesting sidesteps and vignettes (Grave of Cryptic Sorrows). The epic noodly solos coexist well with the dense guitar sound which is thick enough to cut with a knife (Rolling Storm). The drums may be pushed down a bit in the mix, but the bass is allowed to go on the spontaneous audible runs, unrestrained, not reduced to be merely a riff support (Fallen Priest, Am I Really Insane?). The songs on Stone Magnum don’t rush into culmination points, they develop slowly, and often a better part of the song is simply a prelude to prancing chugging heaviness, sometimes less (Savior in Black) and sometimes more (Pictures of Your Life) effective. The latter cut, pushing the vocals to a higher register, does remind of Paranoid at a certain level. An attempt to nail Ozzy, here and elsewhere, were not my favorite moments of the album, as those songs tend to sound a little weepy vocally (Fallen Priest, Rolling Storm). I guess there can only be one Ozzy, and he is better to be left alone. To me, the better way was to be harsh and contorted, and let the melody take it higher when need be, as in the unhurried weave of Locksmith of Misery, my personal album highlight. Opening up creepy and stingy with an expressive hooky riff, this song continues to add on layers, before arriving at the multiple sung-along repetitions of the chorus line. If Pictures of Your Life was Stone Magnum’s Paranoid, then Locksmith of Misery was certainly their Solitude, even if vocals aren’t Langquist. That song leaves an indelible mark and demands repeated listens. Many burly looking biker-like American dudes can pick up guitars and try to jam. Whether the coherent music will emerge is debatable. My small town bars periodically put on bands with Stone Magnum (and more) aspirations. Yet one can tell right away, these are not going to make it past the night at the aforementioned bar. 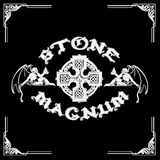 Stone Magnum may have started that way, but their music goes way beyond their looks and there is future in this collective.